We've included listings for companies such as Deco Design Center and Overhead Door Corporation inside our Garage Doors guide. Texas company claims to have invented the first lifting garage door and first electric door opener in the 1920s. Today the company is a leading supplier of garage doors in metal, wood and other materials for residential and commercial buildings. Nation�s largest manufacturer of garage doors for houses. Manufacturer of upscale custom mahogany entry and interior doors; French doors; contemporary and rustic entry doors; wrought iron gates; staircase railings; glass stairs; cable railings and wood garage doors. For 60 years, hand wrought interior and exterior hardware. Hinges, thumb latches, latches, pulls, Entry sets, slide bolts, locks, fireplace enclosures and more. Catalog available. Custom-crafted all-wood garage and carriage house doors, with or without windows. Evergreen specializes in garage doors - and, in particular, in authentic outswing and sliding doors. The company ships to all U.S. locations, and has doors with automated opener systems as well. This small company makes custom, carriage-house style garage doors that swing out rather than up. 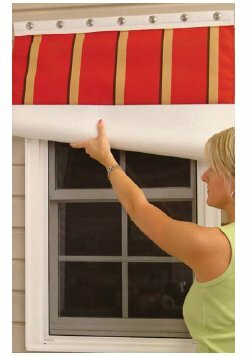 The company takes direct orders and will ship its doors anywhere. Solid wood construction. Automatic openers available. Handcrafted overhead-opening carriage-house-style garage doors in many traditional designs - plus matching entrance gates custom built to your exact specifications. Leading designer, maker and distributor of steel, composite and wood garage doors for residential garages, commercial buildings & warehouses, -- even shopping malls and other commercial applications. Amarr has 17 residential product lines - and sells more than $300 million worth of garage doors yearly. Site explains each product - and includes dealer locator. Designer doors makes a high-end line of garage doors, entranceways, shutters and gates. Its site includes photos, detailed specifications, and tools to find a dealer or order a free catalog. 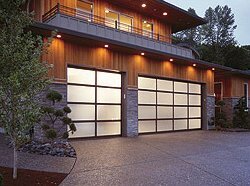 Everclear Windows and Doors, Inc.
Glass panels encased in aluminum give a new look to garage doors.